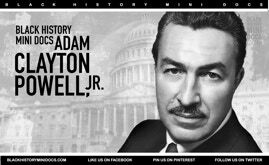 Adam Clayton Powell, Jr. (November 29, 1908 – April 4, 1972) was a pastor of the largest black church in America in his time, the Abyssinian Baptist Church in Harlem, New York City, and an American politician, who represented Harlem, in the United States House of Representatives (1945 – 1971). During his distinguished congressional career, Powell is credited as passing more bed-rock legislation then any other congressmen in American history, even up to today. Powell gain national prominence as a young pastor during the 1939 New York World&apos;s Fair. Powell organized a picket line at the Fair&apos;s offices in the Empire State Building; as a result, the number of black employees was increased from about 200 to 732. In 1941, he led a bus boycott in Harlem; the Transit Authority hired 200 black workers and set the precedent for more. One of these bus drivers was actually my father. Powell also led a fight to have drugstores operating in Harlem to hire black pharmacists. He encouraged local residents to shop only where blacks were hired to work. Powell was a master organizer for change. He would later provide his 20 years of boycott expertise to Martin Luther King Jr. and Rosa Parks. He was the first person from New York of African-American descent to be elected to Congress, and the fourth African-American from the North to be elected in the Post-Reconstruction Era. He became the most powerful Black politician in the Democratic Party, re-elected numerous times and serving as a national spokesman on civil rights and social issues. He also urged presidents to support emerging nations in Africa and Asia as they gained independence after colonialism. He single-handedly convinced Pres. Eisenhower to integrate the U.S. Armed Forces and other government facilities and buildings in Washington DC. He did all of this before any Civil Rights legislation was passed in the1950’s. 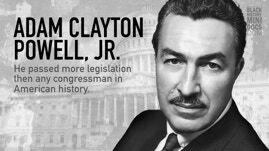 In 1961, after sixteen years in the House, Powell became chairman of the Education and Labor Committee, the most powerful position held by an African American in Congress ever. As Chairman, he presided over federal social programs for minimum wage and Medicaid (established later under Johnson); he expanded the minimum wage to include retail workers; and worked for equal pay for women; he supported education and training for the deaf, nursing education, and vocational training; he led legislation for standards for wages and work hours; as well as for aid for elementary and secondary education, and school libraries under presidents John F. Kennedy and Lyndon B. Johnson. Because of Adam&apos;s seniority and congressional might, along with his paling around with the likes of Malcolm X and Stokely Carmichael, Powell&apos;s enemy list grew in the early 60&apos;s. Many of his so-called colleagues were determined to removed him from his seat as chairman of the Education and Labor Committee at any cost. Following allegations of corruption, in 1967 Powell was excluded from his seat by Democratic Representatives-elect of the 90th Congress, but he was re-elected and regained the seat in a 1969 United States Supreme Court ruling in Powell v. McCormack. Never the less, the damage was done and Powell lost his chairmanship of the Education and Labor Committee, which was ultimately is political enemies main goal. Over the years Adam’s contributions have been literally forgotten or erased from the history books. In replace remains the usual trumped up charges of misappropriations of funds that was proven wrong a long time ago. In fact today’s Black Congress should and can learn many lessons from his great legacy.